Background: Dr. Alan Grodin is an internationally recognized cosmetic dentist who practices in the Detroit area. He draws clients, including celebrities, from around the world. Ceatus has successfully managed Dr. Grodin’s online marketing strategies for more than 5 years. Recognizing the importance of online reviews and reputation management, in 2015 Dr. Grodin again turned to Ceatus — this time to try out its innovative Reviews Manager. Challenge: Like many dentists and surgeons, Dr. Grodin’s online reviews and reputation did not match his true level of skill and experience. His online reviews were not communicating to prospective patients his beautiful results. Before Ceatus’ Reviews Manager program, Dr. Grodin’s average online score was a disappointing 3.55, essentially a C+. Importantly, he only had approximately 20 reviews spread across 75 different health care websites. Solution: In April 2015 Dr. Grodin began using the new Ceatus Reviews Manager program, which allows Ceatus clients to monitor their reviews across every health care related website and, importantly, provides a means to effectively encourage happy patients to post new positive reviews. This unique program is offered to Ceatus SEO clients at no additional charge. By May Dr. Grodin was already achieving major gains! By the end of May his number of reviews jumped to 30 and his average online score was on the rise. By the end of the year, Dr. Grodin’s online reputation reached the stratosphere. The Ceatus Review Manager program helped him increase his number of online reviews to more than 80. His online grade increased from a “C+” to an “A” in the space of 6 months. Dr. Grodin’s average online score is now approaching 5. 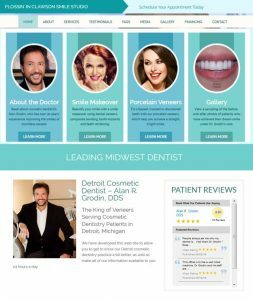 Ceatus also offered Dr. Grodin the opportunity to integrate his newly elevated online reputation into his practice’s marketing strategy by feeding his new reviews to his website. Now prospective patients visiting his website can easily see a number of his recent reviews. His conversions and revenue from his website have increased dramatically with the addition of the Ceatus Review Widget.